The process of securely mounting and accurately leveling a pyranometer to a mounting bracket has traditionally been very difficult. The balance between tightly securing the sensor to the mounting bracket while perfectly leveling the sensor requires great time, skill, and fortitude. Without a secure fit, the sensor’s position will shift, and the sensor’s level will potentially be lost. The process is made even more difficult when the sensor is to be mounted on a tilt to enable plane of array measurement. It is nearly impossible to assure the sensor is both level to the plane and in the perfect azimuth. The CM255LS solves both of these problems. The CM255LS is an adjustable-angle, adjustable-plane mounting stand. The installation technician can now securely bolt the sensor to the mount. Then, using the sensor’s bubble level as a reference, the technician levels the plane of the mount by adjusting the built-in leveling bolts. 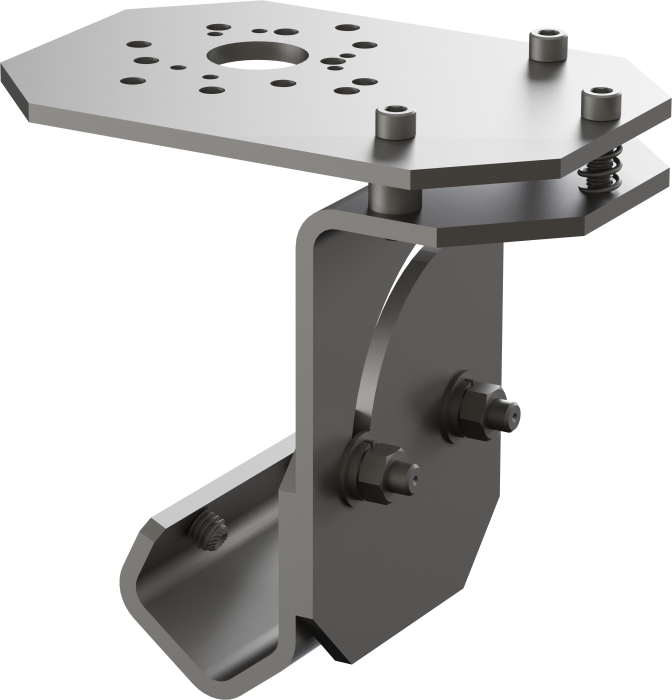 Next, because of the overlapping design between the two components of the bracket, as the mount is pivoted, or tilted, the correct azimuth is maintained─assuming the crossarm is properly installed with a north-south orientation. Our most experienced VAR designed an ingenious diopter that temporarily mounts on the crossarm that is used in combination with real-time solar position data obtained from a Campbell Scientific data logger to orient the crossarm perfectly to the sun’s position. SR20-T2-L Assumes the SR20-T2-L is not housed in the VU01 Heater/Ventilation Unit. The saddle bracket fits 2.54 cm (1 in.) pipe with a diameter of 3.34 cm (1.315 in.). The CM255LS is NOT compatible with rotating shadowband radiometers (RSRs).